My attention to the details of his life just weren’t there… it seemed they didn’t need to be… as a father-in-law to one of my distant uncles, John William Neer was an indirect link in the family tree… and, at one time, I knew nothing of his life, other than that indirect connection. Neer’s simple and unassuming stone, at Green Hill Cemetery, in Martinsburg, West Virginia. I thought the modest stone might reflect what little was available to him, even that many years after bankruptcy, but, in 1903, he spared no expense in purchasing a stone for his wife. Over time, however, especially with my appreciation for the stories of Southern Unionists, this fellow began to strike a chord. Not only that, but the center of his activities during most of his life were in the heart of the area that is, today, my favorite stomping ground. I think I started paying more attention to him after I found both a biographical sketch of him (written while he was alive), and his obituary; both which mentioned his service as a Union scout AND sutler. He didn’t go so far as to wear Union blue, but it seems the Virginia-born man did help the Union cause, when and where he could. As I mentioned in a post back in May, with the denial of his Southern Claims application, I wonder if he felt frustration; not because of the amount of money, but for the fact that the Claims Commission board, in their decision, had reflected doubt toward his level of loyalty during the war. By the time the war opened, Neer was not one to be considered wet behind the ears. At 32 years of age, it appears he had already proven his salt as a working man. In 1850, the (then) 21 years-old native of Loudoun County came to Martinsburg, and was employed as an engine man, on the B&O Railroad. After seven years in that line of work, he returned to Loudoun County and took up farming. Then later, by the time the war opened, he had a 300 acre farm (200 acres of it having been cleared) only four miles from Harpers Ferry, in Jefferson County. I voted against secession; I voted for the Union delegates; but at the time the ordinance was voted on I was not at the polls and did not vote at all. I was engaged that day so that I could not go to the polls. I’ve said it before (for an example, see here)… the area between Martinsburg and Harpers Ferry was no safe place to be as a Union man in the early part of the war. If any man was of the right age, no matter his sentiments, he was a target for being “pressed” into the ranks of the Confederate army. Neer seems to have been one of several such men that I’ve encountered in my research. [Claims Committee]: Were you conscripted into the rebel service? [Neer]: Yes sir. – it was not as a conscript either; I was pressed in by an act of the Governor of Va., or rather of Gen. Carson [Brig. Gen. James H. Carson, commanding the 16th Brigade, Virginia Militia, which included companies from Clarke, Frederick, Jefferson, and Morgan counties] who was acting commander of the militia. I was in for about a month as a militiaman. We were stationed at Winchester, and the first opportunity I got, I left. Every person in the county was taken there, & those who didn’t go were taken by force. For just a bit, this testimony becomes uncomfortably difficult to read when compared against service records on file; mostly because the service records do not align with the testimony. 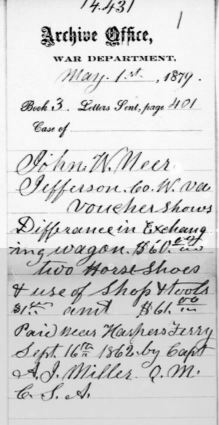 Was Neer being honest in his testimony, or… as what appears to be a trend, even in early Confederate service records… were the service records suggestive of something that really wasn’t the case? In fact, Neer’s Confederate service records with a Virginia militia unit… well, they don’t exist. 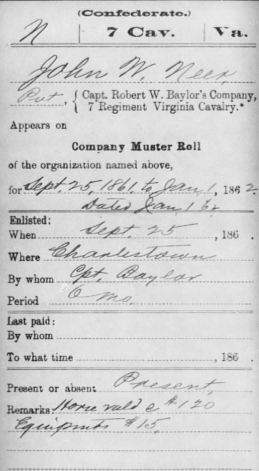 We do, however, see him in the rolls of Robert W. Baylor’s Company, which eventually became part of the 7th Virginia Cavalry (and later still, in the 12th Virginia Cavalry). I do have to say, however, that despite what appears in the CSR (Combined Service Records), Baylor’s company was, prior to the war (and activated for the John Brown raid), the 3rd Virginia Militia. Baylor’s company later served as the nucleus for the “Baylor Light Horse Cavalry”. In turn, this company was officially mustered into service in September, 1861… when Neer’s service records also kick-in. So, perhaps the company continued to carry over that sense of being a militia company, since it was such in years before. [Claims Committee]: Did you desert? [Neer]: Yes sir, I did not consider that I belonged to the rebel service in any way & I got away from them as soon as I could; – deserted them. [Claims Committee]: When was this? [Neer]: In the fall of 1861; Nov or Dec 1861. Indeed, despite no annotation as having deserted, with only one service record card on file, it appears that he was telling the truth. Indeed, as Jones’ pointed out… Neer “done all he could for the Union cause”… and Jones continued to support this statement by adding that Neer began serving as a guide for John W. Geary… then, colonel of the 28th Pennsylvania Infantry… while at Harpers Ferry, early in 1862; Jones being unable, himself, to accompany one of Geary’s scouts, as a guide. Unionist William Scarlett, also remembered Neer’s civilian volunteer service as starting in 1862. Neer’s testimony, however, states that he served for Geary for 8 months, in 1863. Perhaps he combined the total time of service, from 1862 and 1863, under Geary… and it would seem to make sense, considering the total of months that the 28th Pa. was in the area, and then later the months that Geary, as a brigade commander was in the area… up through the end of the Gettysburg Campaign. In the absence of more details of his guide/scout service, I’d like to get my hands in the Captain Benjamin F. Lee Collection [noted in the Gettysburg College Digital Collections, MS-079], in which there is something, dated April 1, 1873, regarding the “claim of John W. Neer and alleged services as a scout for Col. John W. Geary.” Considering the date, I have no doubt that they were seeking proof of his service, for the benefit of the Unionist claim. 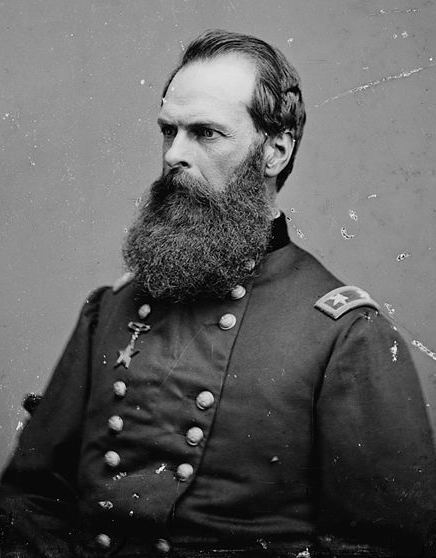 With Geary’s time in the area ending (with his move, along with the XII Corps to the west), Neer sought other affiliations with the Union forces in the area, and, apparently in the Summer of 1864, he began his work as a sutler with Col. David Shunk‘s 4th Brigade (23rd 28th and 24th Iowa, and the 8th and 18th Indiana) of the XIX Corps. Of course, with the departure of this corps, in January, 1865, for Savannah, Georgia, Neer’s noteworthy affiliations with the Union army seem to come to an end. He then returned to farming, in Jefferson County, until 1873. June 2, 1865 – 8 cords of wood @ $5 per; furnished to acting staff surgeon, N. Graham. July 8, 1865 – 45 cords of wood @ $5, also to Graham. Nove. 1864 – 2 horses @ $200 each, taken by Gen. Custer’s Cavalry at Winchester (Neer stated, “I had been hauling sutler’s goods for the Union troops when they were taken”). Neer’s claims process was no different than many others I have seen… it took time… a lot of time. Not only did the Claims Commission have to do their homework… not only looking into the loyalty of applicants… but bringing people together to testify, on behalf of the claimants. Neer himself wasn’t called to make his last testimony until 1878. In September 1861, he enlisted in the 7th Reg. Virginia Cavalry as a private soldier. The conscript law was not then in operation and there is no proof of force. It seems strange, but that’s the hard-line game the Commission played. I’ve got nothing to show regarding what Neer’s thoughts/reactions were over the decision, but… really… he wasn’t doing terribly bad when the news hit. In 1873, he had again found employment with the B&O Railroad. He remained with that position through 1887, when he retired after more than twenty-one years of service as engine man on the B. & O. …purchased the entire stock and fixtures of G. A. Smith, and opened up on King street, near St. Clair Hotel, a first-class general merchandise store. Everything in the line is kept always on hand at the lowest possible figures, and his store is neatly arranged and stocked with fresh goods. He makes a specialty of fine cigars, tobaccos and green groceries. Mr. Neer is a pleasing and accommodating gentleman, and the general public will find in him energy and enterprise, – so essential for the requirements of an upright business. Neer continued to make his home in Martinsburg for the balance of his life, before passing away on February 25, 1910. His obituary wasn’t entirely correct on a few matters, so I won’t provide that as a quote, but, on a personal note, I find that one of his surviving children, Lillian, having been born on July 4, 1871, may provide us with a little more regarding John Neer’s loyalties… for Lillian’s middle name was… “Independence”. [Claims Commission]: Did people call him a Union man? [Scarlett]: Yes, sir, and a great many of them called him a damn Yankee all the time. Then too, in that same stack of barred and disapproved Southern Unionists claims for Jefferson County, there is also a file folder (which is curiously empty) for none other than David Hunter Strother. With that in mind, I consider Neer in good company. * Other Unionists in the Harpers Ferry area identified in the testimony of Neer, Scarlett, Radley and Jones, include Basil Avis, Hezekiah Roderick, Samuel Kelley, Charles W. Johnson, Philip Derry, John J. Stephens, George Neer, John B. Everheart, James T. Read, Oliver G. Butts, and Joseph L. Russell. * W.S. Radley, testified while age 41, and a resident of Loudoun County. At the time of the war, Radley was 5th New York Heavy Artillery, 1862-65. He became acquainted with Neer while guarding Neer’s sutler stores. * William Scarlett served in Cole’s Maryland Cavalry (1st Potomac Home Brigade Cavalry), during the war, having enlisted in the latter part of 1862. * There is also a document that surfaced, in the Claims Commission’s investigation, regarding Neer, that raises an eyebrow… a voucher from a Confederate quartermaster, dated September 16, 1862. Considering Neer rather evasive of Confederate authorities… and for good reason, considering his desertion… I have my doubts that this was something given to Neer, in person. As shown in the testimonies, Neer didn’t hang around when the Union army moved away. Rather, what’s more remarkable, in my mind, is that this voucher exists… and was provided to a Confederate deserter. Apparently, they didn’t conduct any cross-reference checks in the Confederate database, before engaging the services of a deserter. 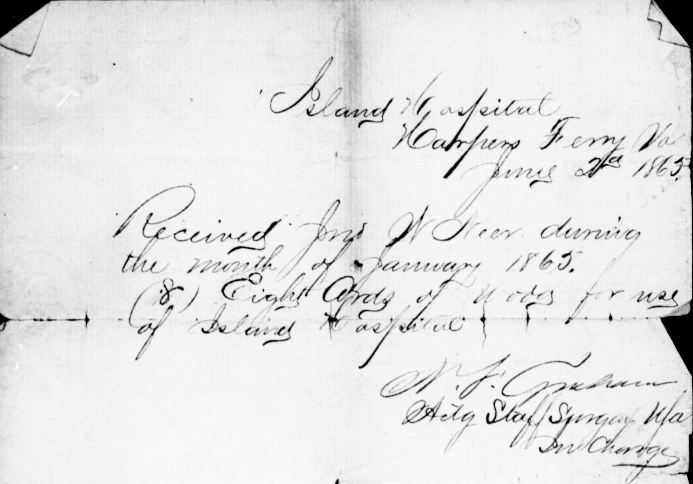 🙂 It’s only a guess, but I think the voucher was left by the Confederate quartermaster, having learned that the property which was used was owned by nobody out of the ordinary, other than a local citizen named John W. Neer… and was totally unaware of Neer’s desertion. Robert, I just read your story about John W. Neer. He is my great-great grandfather and my husband and I live in the house that he bought in Martinsburg in 1880. I purchased his tombstone at Greenhill Cemetery in 2005. Graveyard records at Brown’s Funeral Home indicated that he was buried there but did not have a marker. I have always wanted to know more about the Moore family. Do you have any pictures of James D. Moore’s children. I have a family picture of John W. Neer’s adult children. Whatever happened to the son that survived? Thanks so much for commenting, Sandra! Very interesting regarding the house. I’ve looked around Martinsburg for residences of the Moores but haven’t checked for the Neers. Would love to see John Neer’s 1880 house sometime. Regarding pictures of the children of James D. Moore, I’m afraid I don’t have much to offer. That said, you can check, starting with James D. Moore’s Find-a-Grave page for a pic of him, and then his son, JDM. There’s a bit of a gap in understanding, regarding what happened to the son, but he did pop back up in records years after the death of his parents. Robert, the information on the Moore family is really interesting and helpful. I would like to show the Neer house to you. According to your information, Virginia Violet Moore, the youngest child, lived with her aunt and uncle (James W. and Sarah E. Neer Thomas), in Martinsburg, WV after the death of her mother in 1909. Sarah E. Neer Thomas is my great-grandmother. She bought the house that we live in after John W. Neer (her father) went bankrupt and the house was sold at the courthouse in Martinsburg. After Sarah E. Neer Thomas died, the house eventually became my grandmother’s house. Thanks, Sandra. If you’re interested, I just added more info to J.D. Moore, IV’s Find-a-Grave page. Thanks for the offer to see the house. When things get a little warmer I’ll touch base with you for a visit. I’m just down the road, in Winchester. So glad you found the blog post! Am really happy to find some one that knows about the Neer family. John W. Neer was my great-great-grandfather and I am living in the house that he bought in Martinsburg, WV in 1880. His daughter bought the house when her dad went bankrupt. The house eventually went to her daughter who was my grandmother. I would be happy to share with you the information I have about John W. Neer and his family here in Martinsburg. Hoping you get this. I’d like to visit the house, if possible.